Habit: From well developed rhizomes. Stem: 5--17 dm, densely hairy below inflorescence. Leaf: sheath glabrous; auricles < 0.7 mm; ligule 0.2--2.5 mm; blade 10--95 cm, 3--15 mm wide, upper surface +- scabrous. Inflorescence: 12--34 cm; spikelets generally 2 per node, sessile or stalked. 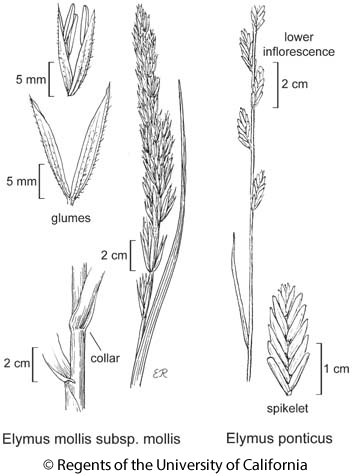 Spikelet: glumes 13--30 mm, lanceolate, flat, slightly to densely hairy; florets 3--6; lemma 12--20 mm, densely hairy, acute to awn-tipped; anthers 4--9 mm. Chromosomes: 2n=28. Ecology: Sandy beaches; Elevation: generally < 10 m. Bioregional Distribution: NCo, CCo; Distribution Outside California: to Alaska, Asia. Flowering Time: May--Jul Note: Other subsp. arctic. Unabridged Note: Hybrids with Elymus triticoides are called Elymus ×vancouveriensis Vasey. Citation for this treatment: James P. Smith, Jr. 2012, Elymus mollis subsp. mollis, in Jepson Flora Project (eds.) Jepson eFlora, http://ucjeps.berkeley.edu/eflora/eflora_display.php?tid=70142, accessed on April 22, 2019.